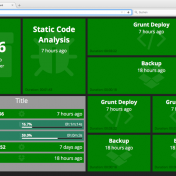 Dashing Jenkins Job is an excellent dashboard for Jenkins that can be customised according to the needs of the development team. It is based on Dashing. Pinterest has recently announced that it will open source its deployment automation tool – Teletraan.